Welcome to the proiperty site of one of the probably finest resorts of Majorca, the enchanting Puerto Pollensa . From villas and apartments for sale, buy to let offers, plots of land and investment opportunities,hotels, flights and car hire to eating out in well known restaurants, you'll find it here. This resort has everything - wonderful scenery, beautiful sandy beaches and a laid-back friendly atmosphere. The sheltered horseshoe shaped bay is set against the stunning backdrop of the Tramuntana mountain range. No wonder it remains a favourite with families and couples who return time and time again. 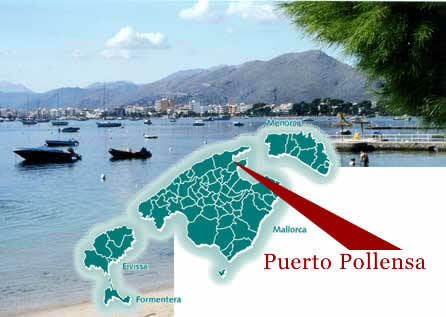 Originally a fishing village Puerto Pollensa retains the time old tradition of the evening paseo or stroll. On warm, balmy evenings everyone wanders up and down between the marina where the yachts are moored, past the pavement cafes and along the celebrated Pine Walk as far as the elegant Illa D'Or hotel. Holiday options range from inclusive independent holidays renting out a sophisticated villa right on the Pine Walk or a Spanish country house with large swimming pool. You'll find details on Puerto Pollensa, the neighbouring town of Pollensa (Pollenca) and the tranquil resort of Cala San Vicente (Cala Sant Vicenc). We have Villas, Apartments, Townhouses and Country homes for sale in all of Mallorca , wide range on front line properties with tremendous sea views. New build Villa 10 minutes driving to Puerto Pollensa and the beach, 3 bedroom suites with bathroom each, fireplace, private swimming pool, heating and Air conditioning, BUY-TO-LET potential, 10 year building warranty.